“DASH”, is the process of extraction of aquatic vegetation using a suction hose and collection system that is guided by a diver. Our suction system consists of specially outfitted boats that have been fitted with pumps and a filtration or bagging system. 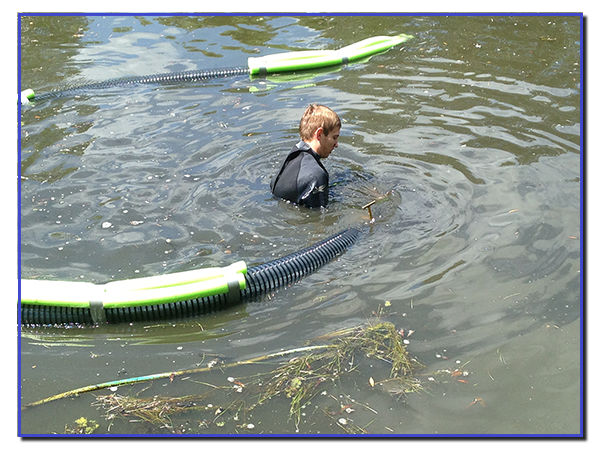 The diver uses the suction system to remove overrun and invasive plant species by the root system. Other removed material usually includes past years’ plant debris that has accumulated on the bottom of the waterbody. In the right applications, suction harvesting is a best management practice process for removal and control, because it removes the entire plant and its connected root system. Minimal water is removed from your waterbody during the DASH process. Large materials flow into the filtration bag at rates up to 1200gpm, while water returns to the lake or pond. Different filtration bags are available that allow for the separation of water and debris. Collected plant material is stored in bags and moved to an off-site location. What sets DASH apart from weed cutting or chemical treatments? Much like removing weed infestations in someone’s backyard, the best way is to pull out the weed together with its roots. This way the chance of regrowth is minimized. Cutting weeds back will usually only work very temporarily before the waterbody experiences regrowth to the original spread. This concept is no different in the water. Just cutting back the nuisance plant will in many cases, not last through the season. When pulling weeds out while in the water, it is difficult to remove large amounts of plants simply because one cannot traverse the area as easily. 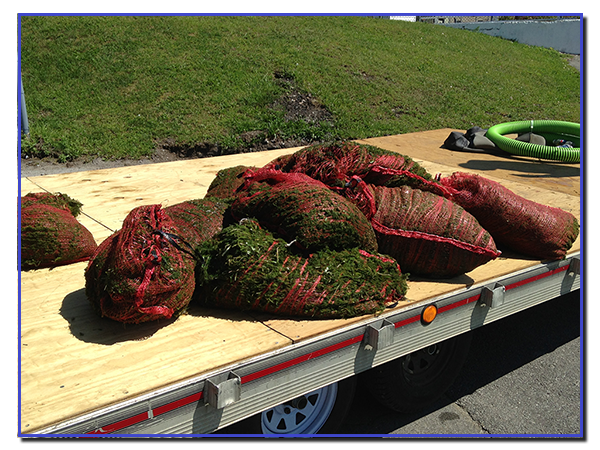 There is also the problem of transporting the extracted weeds to a boat or shoreline. This is where the suction harvester boat benefits comes in. The diver pulls the plant out together with its root system and uses the suction system to remove it from the waterbody and bag it in filtration bags. 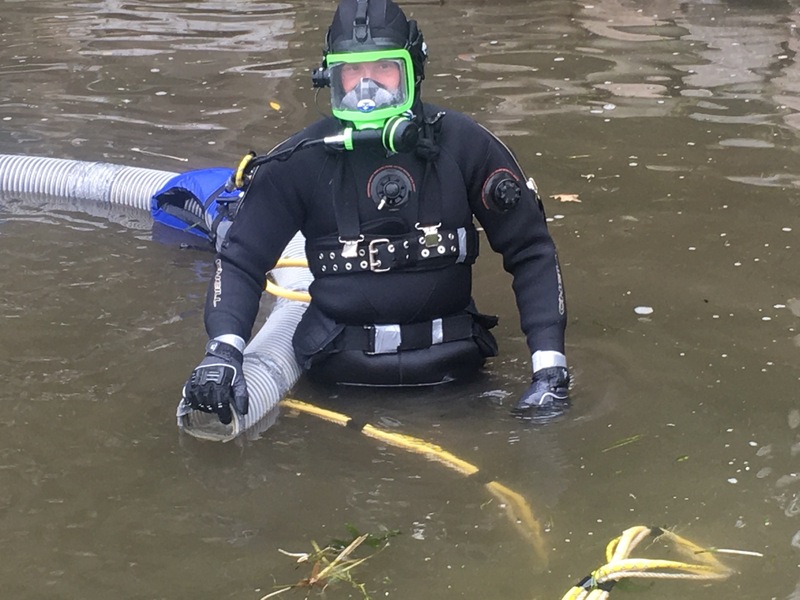 This way, the diver can concentrate on targeting and pulling the right plants and doesn’t have to interrupt his work flow to transport heavy vegetation to the vessel or shoreline. The goal is to remove the roots to limit regrowth by absence of plant fragments to propagate. Chemical treatments have different problems. While chemical applications are mostly successful at destroying nuisance plants with much less labor involved, this method not only eliminates the targeted plants, but other non-invasive species and has relatively unknown chemical side effects in your waterbody. Decaying plant material will remain in the water body, accumulate on the bottom, and initiate other biological nuisance problems such as increased muck accumulation and a significant decrease of dissolved oxygen availability for larger biota. How large of an area can be harvested and how long does the DASH treatment last? While DASH treatments vary depending on many factors, our divers can typically expect to weed harvest 5,000-6,000 sqft in a one day treatment (80ft of frontage by 70 ft out). Factors that could dramatically alter coverage dimensions and longevity of reduced weeds of serviced area include weed type and density present, nutrient levels and land-use run-off implications, do they cut weeds on your lake?, are you on the windward side of the lake?, bottom type, water depth, also over-winter weather. A site visit from our field manager will help determine an expected coverage and recommended service time frame of the area to be harvested. With one DASH application at a suitable time frame, one could expect improvement by two density levels. For example “Highly populated to Scattered”. 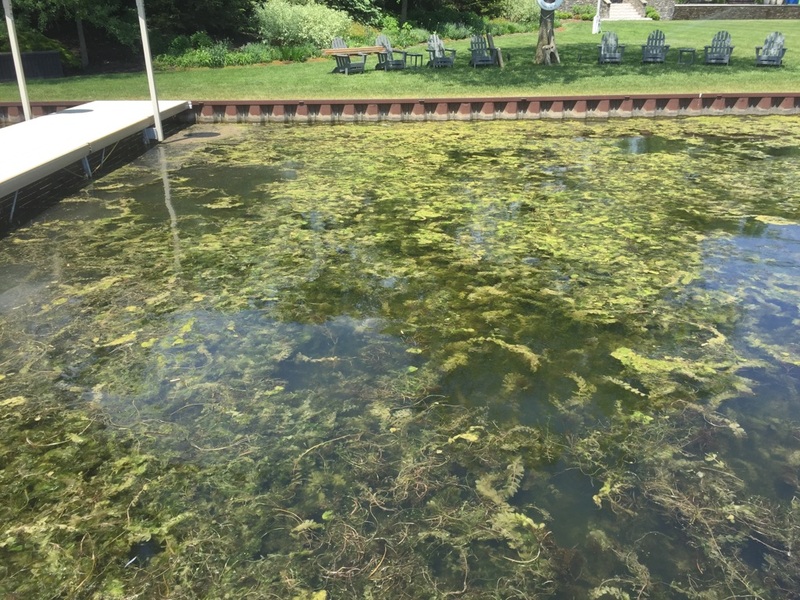 Dense patches of prolific and persistent species like Eurasian Milfoil, Curly Leaf Pondweed, and Lily Pads may be tougher to completely remove in one application, but it is expected that with multiple treatments, complete eradication or extended relief can be achieved. 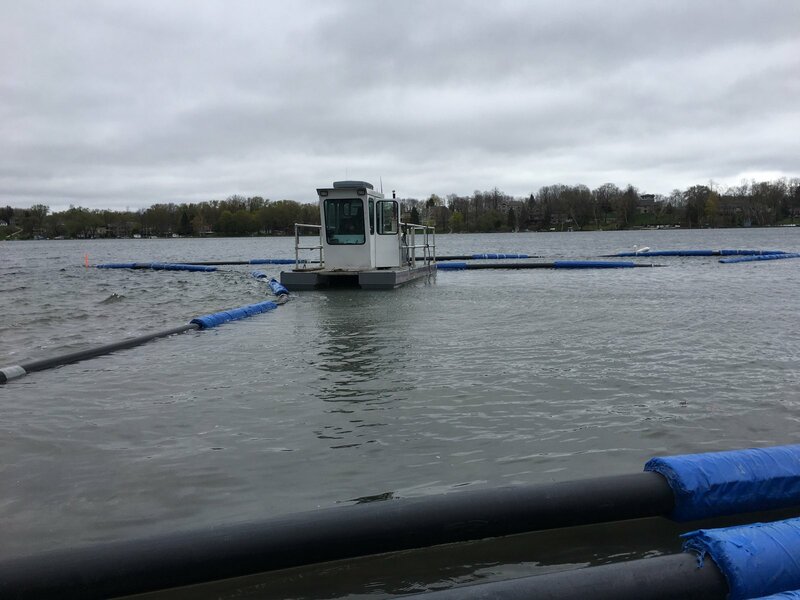 We’ve worked closely with Wisconsin DNR many times on 2-3 year projection plans toward complete eradication of aquatic invasive species in Wisconsin lakes. I have a build up of leaf material and have difficulty getting my boat on and off my lift, does Eco remove leaves? Yes, Eco has recently began using our suction method to remove leaf debris in order to help with boat navigation. Depending on the depth of leaf material we have taken as much as 2.5 feet on some properties, bringing years of navigational ease. The suction harvest time is a little different than for weeds, because we need to hand feed the leaves into the hose and potentially removing feet of material, expected harvest area can range from 800-2,000 sqft in one day of treatment. However, in some cases accumulation of muck greatly outweighs leaf material and not as much depth can be achieved. If interested in the process please contact us in order to set up a site visit. What do you do with the sediment? 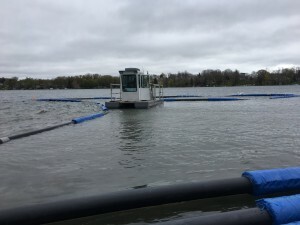 When performing DASH, we are not allowed to remove lake bottom sediment, and move or displace any sediment as little as possible, unless we obtain a dredging permit. When weed harvesting, we are strictly taking large material that stays within an onion bag mesh. We take the bagged plant material to an offsite location, unless the owner would like to dispose of the material themselves and save on disposal cost. When we dredge, we are taking sediment at an amount specifically stated on a permit granted by Wisconsin Department of Natural Resources. When ECO removes sediment via dredging process, the owner of the property is responsible for ultimate disposal of the material. Lawfully, it is not allowed to be sold. Often a landscape company or the owner will take the uncontaminated material and spread in an off-site, upland location. What permits do I need to dredge my property? What size of an area can be covered in a 25CY or 50CY dredging project? As an example, a typical boat navigation path from shoreline along a dock can be 30 feet wide by 45 feet long, or 1,350 square feet. If you are looking to increase depth by 1 foot, that would equal about 50CY of in situ material. In situ material is typically 50% water so you would be removing approximately 25CY of material. If you are looking to increase depth by 2 feet, that would equal about 50CY of material being removed. What if I have more than 50CY of material I want removed in a year? If your sediment problem is extremely bad and you don’t think 50CY is an efficient way of fixing the situation, the other option would be to apply for a regular dredging permit. We do offer this service as well using a hydraulic auger dredge. These permits take a lot longer to obtain, and the project costs are substantially more than a small-scale dredging project. We would highly recommend partnering up with multiple neighbors for a project like this to help share the fixed costs of set-up and equipment. 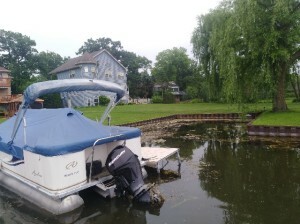 How do I know if my lake has a man-made impoundment? The Wisconsin DNR website is very resourceful. We use the Surface Water Data Viewer interactive map to find information on your lake. There are many different layers you can add to the maps including a dam layer. You can also find information by searching ‘DNR dam data downloads’. There is also an eligible lake list link on DNR website, that be accessed to inquire if your lake has been determined to be an impounded lake eligible for 50CY dredging. If you have trouble locating these resources, we can look it up for you. How do I know if my lake is considered an outstanding or exceptional resource water? The Wisconsin DNR website is very resourceful. We use the Wisconsin Water Search page to find lake information. If you have trouble locating these resources, we can look it up for you. Are there any restrictions on when dredging can occur? 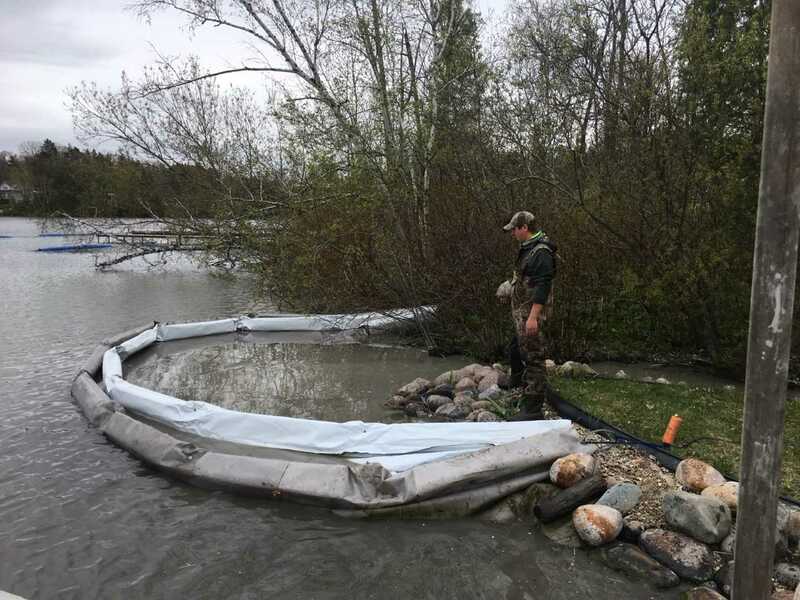 DNR may restrict dredging from March 1st through June 15th to minimize impacts on fish and other biota movement, spawning, and egg incubation. Prime dredging time is usually between August 15th and November 1st. How long does it take to do a small-scale dredging project? Without any major complications, we expect a 25CY project process to take 3-days and a 50CY project to take 4-days. Double the material removed does not mean it would take double the project time due to the approximate 2 day set up and take down time required for these projects. How long will the dredged area last without having to dredge again? There is no standard answer. It will depend on how much activity there is in your dredged area. The more activity, the longer it will last. The less activity, the more the water current will have an affect on slowly filling the dredged area by surrounding sediment. Also, since this is a newly DNR approved service, there is not much epidemiological information available for a definite answer to be given. Large scale dredging, while more costly, usually lasts 7 to 15 years, depending on the many variables of lakes. 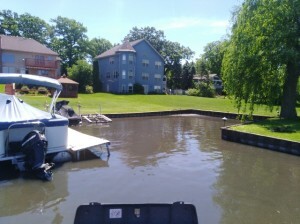 What does a Small Scale Dredging project by Eco Waterway Services look like? 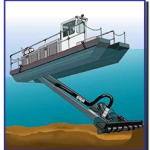 Eco provides Hydraulic Dredging services by means of suction pipe, hoses, and pumps. Generally, sediment is pumped into Geo-Textile Tubes, with the carriage return water being released back to the water body. Geo-Tubes are either placed at a designated site on land, or within 30yd dumpster containers. Geo-Tubes must be in a predetermined location that will allow them to dewater over a period of time before they can be opened, and the dried sediment ultimately disposed of. Eco does not offer ultimate sediment disposal services. Typically, the customer uses the nutrient rich material on their property somewhere where it will not find its way back to the water body, or they contract with a landscape company or farmer to take the material. A site visit will be needed to evaluate your project. What type of site preparation is required? We will usually schedule a riparian site visit to determine with the property owner, if there is enough room for our equipment, a laydown area for dredged sediment to be contained in the Geo-Tube, and verify a feasible slope for return water to the water body. Generally, tarps, boards and other erosion and damage control methods are used to direct water back into the water body. We will also take photos of the service site for permitting requirements by WIDNR. What type of site requirements are needed for the Geo-Tubes? The dimensions of Geo-Tubes used vary depending on the site laydown area available. For a 25CY dredging permit service, we would need at least 25′ x 25′ flat area to be able to place the geo-tube. For a 50CY dredging permit service, we could potentially double smaller tubes, or use just one larger geo-tube if your site allows. If we do not have a feasible area on the ground for long-term storage, we can also make use of a 30yd dumpster container for the geo-tube, and transport the material after the majority of water has been released. The Geo-tube may not be temporarily or permanently placed in a wetland area or a local floodplain under any circumstances. How long does it take for the dredged sediment to dewater enough for disposal? This would depend on how you plan on disposing of the material. If you have a nearby farmer or landscape company that wouldn’t mind receiving the material semi-dewatered, the material could be dropped off or picked up within a week. Otherwise, dependent upon the size of the geo-textile tube, weather, and the type of material dredged, it could take anywhere from 2-8 weeks to be considered dry enough for a landscape company to take and use it. Who is responsible for site remediation after the dredging project is complete? Eco Waterway Services does not claim responsibility for site remediation after sediment dredging. We promise to be as courteous and as careful as possible with your property, taking measures to minimize any ruts or erosion. 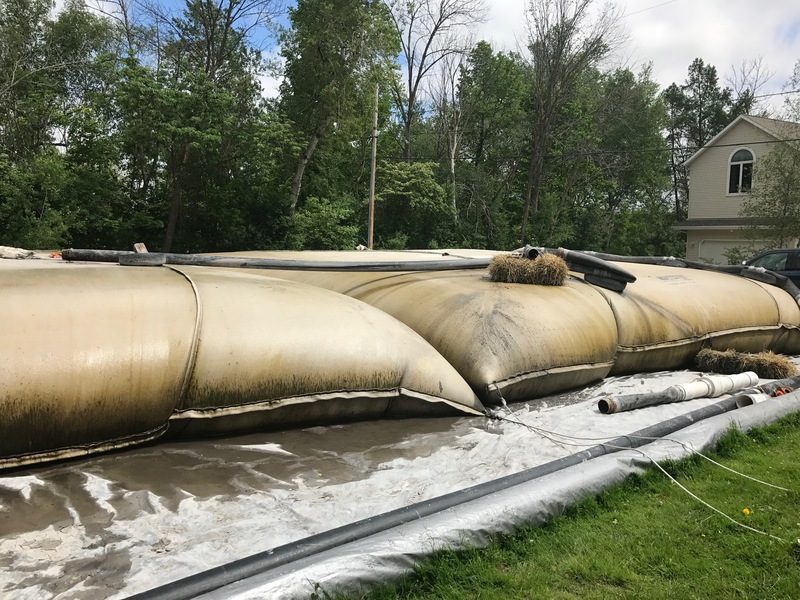 However, the sheer weight of a dumpster or filled geo-textile tube is likely to depress into the softened ground below. Also dependent upon how long the material needs to stay on-site to dewater, there will need to be reseeding of grassy areas. 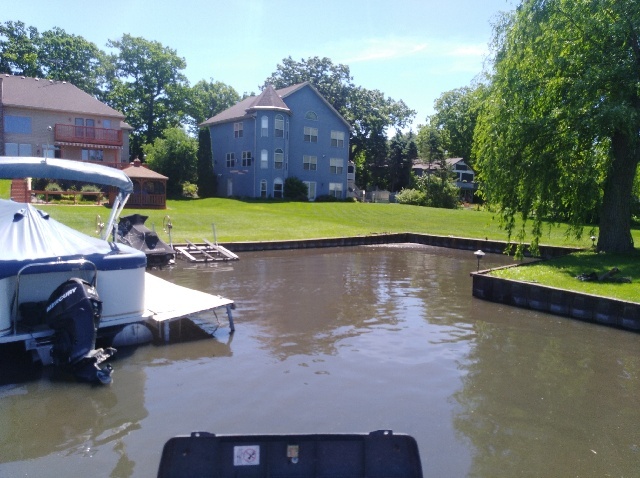 Eco Waterways applies for your permits to Wisconsin Department of Natural Resources (WIDNR) included as part of our service proposal, after receipt of your initial deposit funds. We submit documents, site maps, photos, process descriptions and methods, track the permit, etc. These small-scale dredging permits were designed with you in mind. DNR is trying to get as many private riparians who are struggling with these sediment issues, permitted. It may depend on how busy DNR is, but the approximate turn around from the time the permit is applied for to the time your permit is issue is 1 month. Are there any other studies or permits that may be required? In addition to your General Permit for dredging, a Water Discharge Permit (WPDES) and an Endangered Resources Review will need to be done. A Sediment Analysis may need to be done in accordance with WIDNR requirements and recommendations. Eco will also handle the administrative duties for these requirements included in our standard proposed service to customer. It is important to note that there may be local municipal and county permitting regulations required in your area. Property owner is responsible for compliance with these local regulations. If Eco is requested to file them for you, there will be additional process and permit fees. How much does Eco’s small scale dredging service cost? We will provide a specific estimate based on individual project scopes. However, in general a 25CY project would cost about $8,000, and a 50CY project would cost about $11,000, including all WIDNR permitting admin and costs. Is there any cost savings if multiple riparians participate in a small scale dredging project? Unfortunately no. Each participant will need their own permit, and their own location for their Geo-Tube adjacent to removal site, and each owner is responsible for the ultimate disposal of their removed material. This requires individual set-up/take-down services. There is significant cost savings, however if a group of riparians participate in a large scale dredging project together.